I love him with precision. The way he blinks his eyes as though in prayer. The way he hides behind the curtain of his hair. As delicate as his fingers on the strings of my heart. That rumbles from his belly. The veins on his arm. 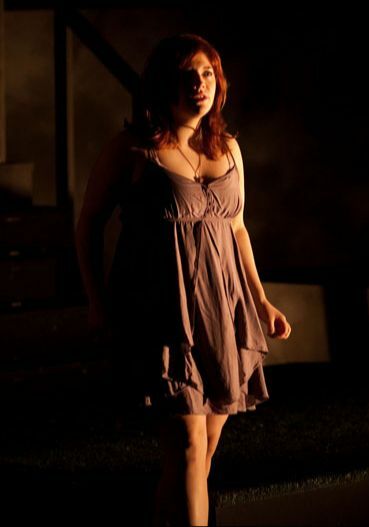 About the scene: Eurydice, once the High Priestess of Aphrodite, the goddess of Lust, has since left her mistress' service to seek out something more. She finds it in the musician Orpheus. This speech comes as a response to Adonis' jaded question: "How do you love him?" About the verse: Of all the verse speeches here, this may be the most modern. Feel free to approach this with hesitancy proceeding bursts of thought. Punctuation will be your friend here. But make sure you're still thinking on the line. It's a fairly short monologue and should not run much longer than a minute. About the scene: Psyche, a mortal woman who distrusts love, has finally surrendered herself to marry Love Himself, the god Cupid. Waking up for the first time in his Kingdom, she tries to reconcile what she experienced in the darkness with her deep doubts and misgivings about affection. About the verse: This begins, purposely, as a slow soliloquy. Although Cupid is beside her, sleeping and in shadow, Psyche speaks to us alone. Don't be afraid to sit in the humor of the piece as well: Psyche generally laughs at the world. The sensual languor of it is new and terrifying for her. In this speech, antitheses are your friends. Looked I like this when I lay in my Husband’s bed? Cast carelessly upon sheet and skin alike—? And where is your Love then? Of quarreling over coffee cups! O—! Heed me, mortal! I beg you, girl: awake! Lamenting, that ever Love provoked them. Thou art as Happy as ever thou shalt be. About the scene: Persephone, the fallen goddess of the Spring, now imprisoned half the year by her husband Death, sits by the marriage bed of Eurydice and Orpheus, contemplating her own bleak marriage, as well as the romance she once had with the young and capricious god of Love, Cupid. By the end of the soliloquy, Persephone - becoming the goddess of Death - smothers out the life of the young bride Eurydice. About the verse: Persephone is not in her right mind here. Her verse is all over the place, with half-finished lines, interrupting her own thoughts as she fills with jealousy and sorrow. Her "O's" are still in full effect, and you are welcome to vocalize on those sounds as you like. As always, keep an eye on line endings and white spaces. Having no worshippers left to worship me…! And then that dust—I sneezed!, and he was gone. Weary ghosts still haunting their own bodies. I cannot remember what an infant is. ‘Tis ages since I’ve seen a child of twelve. March on to their graves, and cannot be dissuaded. About the scene: Aphrodite, the goddess of Love, in rags and losing power, travels to the Gates of Hell to find her dead lover, Adonis. Since she set her son Cupid to kill Psyche (whom he married instead), the world has turned upside-down, leaving Aphrodite out in the cold. About the verse: This is actually a fairly measured speech from Aphrodite, and perhaps the most vulnerable we ever see her. The central image requires that the actor really envisage all that Aphrodite describes: of the world slowly sinking towards Death.